The NFL has the ‘fairest’ distribution of salaries across its 32 teams of any of the ‘big five’ US sports leagues (NBA, MLB, NFL, NHL and MLS) when you take into consideration the differential between the best paid team and the worst paid team. It is also much fairer than any major football (soccer) league. This was one finding in the Sportingintelligence Global Sports Salaries Survey 2011, which was published in April last year and also revealed Barcelona and Real Madrid had overtake the NY Yankees as the world’s best paid sports team, and that the NBA is the world’s best paid league by average earnings per player. In our 2011 report, we found that the best paid NFL team, the Washington Redskins, had average first-team pay of £1,736,648 per year in the 2010-11 season ($2,778,636), or £33,397 per week ($53,435), which was ‘only’ 1.79 times as much as the worst paid NFL team that season, the Tampa Bay Bucs (owned by the Glazers of Manchester United fame), where average first-team pay was £1,014,818 ($1,623,709) and weekly pay was £19,516 ($31,225). That 1.79-1 ratio was better than in the other US sports although not hugely ahead of the NBA (1.96-1) and the NHL (1.99-1) while the MLB (6.38-1) had a bigger differential than the MLS (6.32-1). For truly ‘unfair’ distribution, look no further than Spain’s La Liga (39.47-1) and Scotland’s SPL (34.2-1). 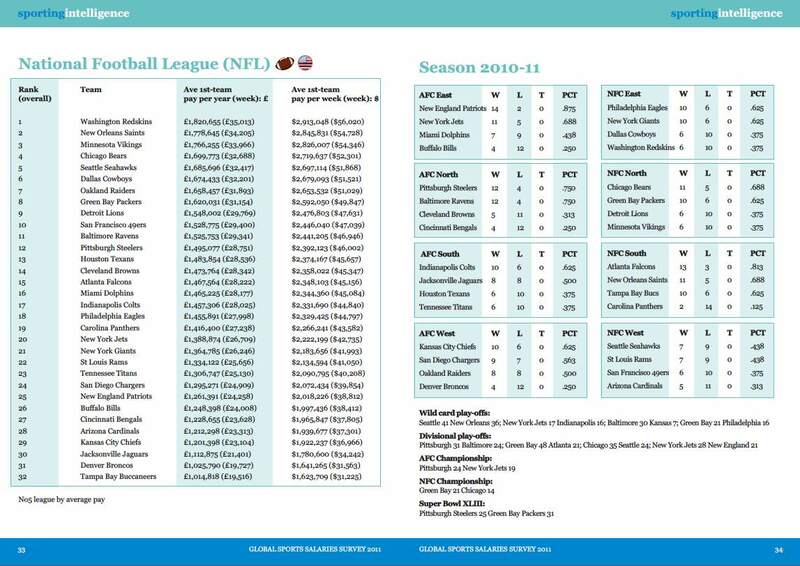 The fairest of all leagues considered in the full report of 14 leagues in 10 countries across seven sports, was Australia’s AFL Aussie Rules (ratio 1.08-1). 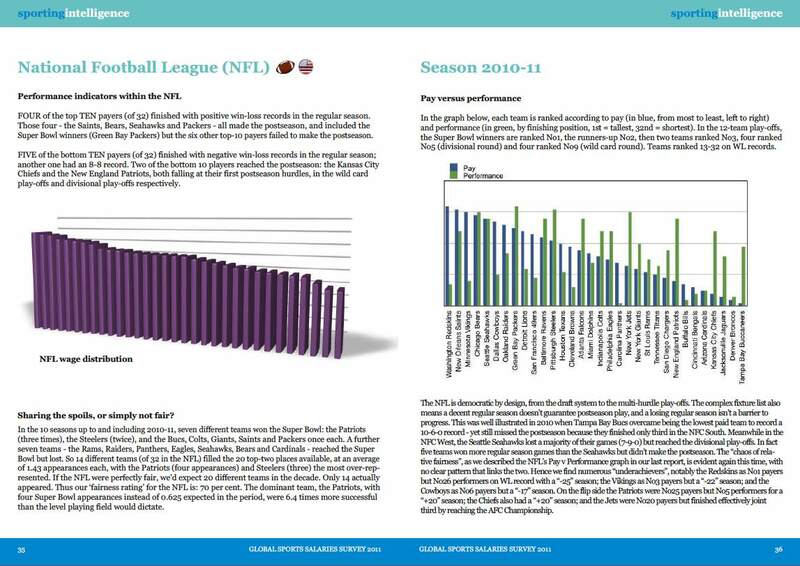 The full 78-page report contains an overview of pay per team and some rudimentary analysis league-by-league of the relationship between pay and performance in each league. Given last night’s Super Bowl between the Giants and the Patriots, and the interest on Twitter in these themes, below are four of the pages from the GSSS 2011 dealing specifically with the NFL and its chaos of relative fairness.